Commercial environments have unique pest control needs, and your hotel, motel, or apartment complex is no exception. Want to stand out from the competition and keep bed bugs at bay? You can rely on Cryonite. Cryonite is an innovative, non-chemical treatment that proactively prevents bed bug infestation. How? Cryonite prevents bed bugs from taking up residence at your commercial property with the help of CO2 (carbon dioxide). Cryonite rapidly freezes bed bugs, killing them in all life stages, including eggs, without the use of insecticides. Don’t let bedbugs wreak havoc on your bottom line. Kills adults, nymphs, and eggs, including insecticide resistant bed bugs . Can penetrate behind headboards and into cracks and crevices. Discreetly protects your reputation and your guests’ safety. Minimizes downtime, allowing for the reuse of rooms immediately following treatment. Is environmentally friendly, reducing the risks associated with insecticidal treatments. Prevents reputation-damaging media coverage and lawsuits. Eradicate these stubborn pests with the help of Stern Environmental Group, one of the first firms in the U.S. to utilize this cutting-edge system. The top bed bug exterminators in the New York City metro area, Stern Environmental Group provides quality commercial pest control services at an affordable price. We’re pleased to see America’s go-to source for reliable home tips spreading the word about do-it-yourself bed bug treatment. Too many people are injuring themselves and putting their families at risk by trying to treat bed bugs themselves. The Centers for Disease and Control and Prevention recently reported a noticeable rise in reports of “acute illnesses” related to ”excessive insecticide application” by do-it-yourselfers trying to rid their homes or apartments of these blood-sucking pests. Bed bugs are impervious to house and garden pesticides. Trying to kill bed bugs with household sprays or bug bombs will only send bed bugs into hiding and fill your home with toxic chemicals that can endanger the health of your family and pets. The only safe and effective methods of ridding your home or office of bed bugs are application of extreme cold using the Cryonite system, extended application of extreme heat or multiple applications of professional pesticides. In all cases, extermination should be performed only by a licensed pest control professional with proven expertise in successful bed bug extermination. If you have bed bugs, call the bed bug experts at Stern Environmental for fast, non-toxic extermination. How Cold Does It Have to Get to Kill Bed Bugs? Bed bugs are sensitive to extreme temperatures. When correctly applied by an expert bed bug exterminator, both high heat and freezing cold can and will kill bed bugs. In both cases, a certain temperature must be reached and maintained for a specific period of time to guarantee the death of these insects. However, a recent study indicates that bed bugs may be better that previously believed at protecting themselves against low temperatures. Like many insects, bed bugs have the ability to shield themselves against injury from cold temperatures by lowering the freezing point of their body fluids. 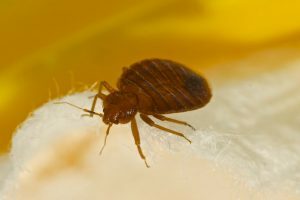 As reported by the Entomological Society of America, a new study has been able to document bed bug behavior at various low temperature exposures and durations, providing pest control professionals with reliable bed bug control data. Study results validate the instantly lethal effectiveness of Stern’s Cryonite bed bug extermination system. Researchers found that at temperatures below 5 F., bed bugs at all stages of development died within 3.5 days. Decreasing the temperature, shortened the necessary exposure time to guarantee 100% extermination; although some bed bugs were able to survive short exposures to below zero temperatures down to minus 13 F. Our Cryonite system uses a carbon dioxide “snow” super-cooled to a temperature of minus 110 F. which instantly freezes and kills bed bugs at all stages of development, including eggs.